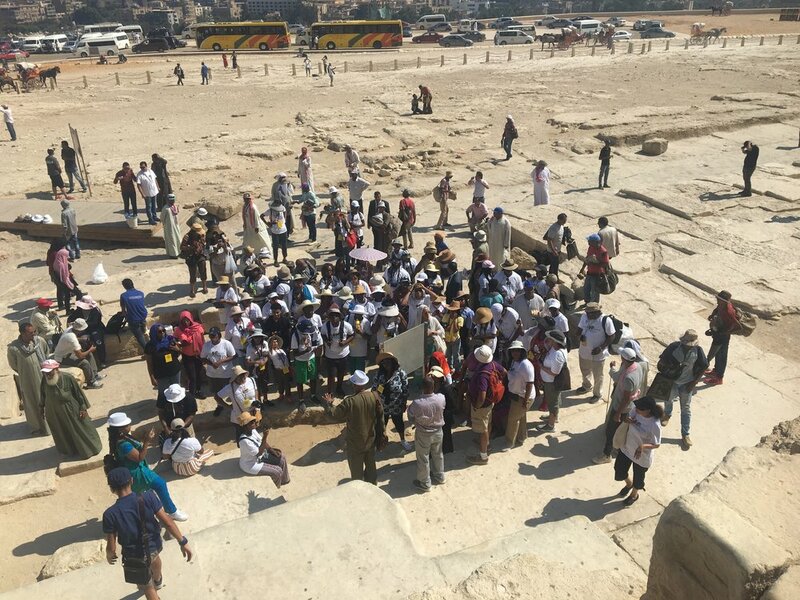 Our first day of #HUStudyAbroadKemet2018 field exploration and discussion began on the Giza plateau overlooking modern Greater Cairo, a North African city swiftly approaching two dozen million people. We had come to consider the formation and genealogy of the Kemetic state, like China a civilizational state (as distinct from modern settler colonies turned states of the “Western” Hemisphere or the artificial states produced in the wake of western-style colonialism in the “Eastern” Hemisphere). Our group is primarily students from college sophomores to PhD candidates and faculty and staff from two Historically Black Colleges and Universities. The youngest traveler, my 15 year old nephew, Ellington Fuller, is a rising high school junior. Ellington Fuller, 5 months, with Jacob Carruthers and the author, 21st Association for the Study of Classical African Civilizations Conference, Tennessee State University, March 2003. Ellington was five months old in March, 2003 when Dr. Jacob Carruthers (Djedi Shemsu Djehuty, or “The One Who Speaks is a Follower of Djehuty,” Founding President of the Association for the Study of Classical African Civilizations (ASCAC) held and spoke to him in a penultimate act of intergenerational dialogue. Baba Jedi made transition shortly after. Now Ellington, a late adolescent scholar athlete with his mother’s wit, his father’s demeanor and his grandfather (my father)’s peaceful and introspective spirit, has been entrusted to us for his first trip to Africa. On March 17, 1995 at the 12th annual ASCAC conference in Detroit, Michigan, Dr. Carruthers delivered a major address, “The Elder’s Staff,” where he took the ASCAC “study group of the whole” through a passage from the sebayt (teachings) of Ptahhotep, called by Asa Hilliard, Nia Damali and Larry Obadele Williams “the oldest book in the world.” Ptah Hotep begins the sebaytby enumerating the ailments of old age, including loss of energy and memory. He then asks the Late Fifth Dynasty Per Uah[“Great House”, now called “Pharaoh”] Issi, if he might be allowed to take an apprentice and make of him a “mdw iaw,” or “speech (staff) of old age,” to whom he might then transfer “the speeches of those who have heard”: The collective memories and distilled wisdom of the Ancestors. The Sebayt of Ptahhotep was used to train schoolchildren in reading, writing and ethics in the Kemetic nation over the course of two millennia. Ptahhotep’s unfinished tomb, in the Kemetic national burial complex of Saqqara, is near that of Kagemni, author of another majory sebayt; Teti, an early Sixth Dynasty Per Uah whose pyramid contains prayers of the corpus referred to collectively as the “Pyramid Texts,” and Mereruka, Teti’s Vizier, one itme Senior Judge of the sprawling network of regional and national Kemetic courts, over fifty-one centuries before U.S. Chief Justice John Marshall delivered his opinion in Marbury v. Madison, burnishing and extending the myth of what Pauline Kael has called the “American Scripture” of the U.S. Constitution. In anchoring the in-situ dimension of our intellectual work with problematics of nation building as presented in the remains of the Kemetic nation in Saqqara and on the Giza Plateau, we considered several first order questions at the day’s beginning and in hours of our evening class after returning from our visits: How do societies preserve and convey the best of what they have learned to future generations? How has Africa and how do Africans achieve this objective, on our own terms, across time and space? How, in fact, did the Africans with the longest recorded experience of building and sustaining civilization think of time and space and the place of humanity in the cosmos? We began our day by entering the most recognizable structure of human antiquity: The so-called “Great Pyramid” of Khufu, son of Fourth Dynasty founding Per Uah Sneferu, on the Giza Plateau. Dr. Mario Beatty shared a new article with the group reporting findings of an international team of scientists who hypothesize that this pyramid harnesses electromagnetic energy of a fashion conducive to restorative and regenerative benefits for living material. Certainly, this would not be a surprise to African Diasporic artists from Louis Armstrong and Paul and Essie Robeson to Sun Ra and Earth Wind and Fire’s Maurice White, all of who travelled to the pyramid and drew direct inspiration and creative instruction from Kemetic culture. Next, we descended the plateau to walk and examine the great ritual hall and pyramid complex conceived in the Third Dynasty (c. 2700 bce) by the famous Imhotep, Vizier to Per Uah Djoser. Discussing Imhotep’s planning and construction of the oldest stone building in world history while standing in and examining it is an experience that forever erases one’s predisposition to believe any prior (mis)educational assaults on the nature of African scientific achievement, giving a (re)newed meaning to the term “STEM”. Before leaving, we visited the Hor-em-Akhet [Horus on the Horizon], colloquially referred to as the "Great Sphinx of Giza," the likely visage of Per Uah Khafre. In a long-practiced ritual by visiting African people, we compared our physical profiles to that of the Sphinx's head. The idea that these Egyptians were not African people (in the way that we acknowledge the full physiological range of our "modern" existence) is, of course, absurd. We stood in the great expanse of Djoser’s pyramidal courtyard as a desert breeze caressed the mute sands where thousands of Kemetic citizens had beheld the Heb Sedfestivals of Pharaonic ascension twenty seven centuries before the birth of Jesus Christ. Standing in the distance in one direction were huge predecessor pyramids constructed by Sneferu and in the other direction the previously-visited pyramid of his son Khufu, Khufu’s son, Khafre and Khafre’s son, Menkaure (and the women who had birthed them, married them and/or been sisters to them). Saqqara is the crossroads of Kemetic—and by extension, world—state formation and governance. That it was an African enterprise that lasted over thirty centuries and birthed the foundations for much of what we have received as human knowledge can seem fantastical until one literally stands in the places. It is not enough, of course, even to travel to Egypt and see these places. At one time, Giza, Saqqara, and the tombs of Ptahotep and his fellow wise elders and advisors teemed with visiting tour busses from around the world. The so-called “Arab Spring” disrupted this steady flood of human curiosity. White Americans have not returned. A sprinking of Europeans and Asians periodically dot the once-crowded ruins, with the balance of visitors being comprised of groups who have been coming to the Nile Valley in large numbers since the 1960s: African-Americans and others from the African Diaspora. That genealogy, to borrow a phrase from the late Malian scholar Hampate Ba, remains a living tradition, apprenticed from life to life in a fashion that Ptahhotep would no doubt recognize. It is passed from generation to generation, as Carruthers notes, by those who take their intellectual work on behalf of Black communities formed in cauldrons of modernity as articles of faith and responsibility and acts of (re)membering. Like many other life lessons, these sebaytmove along communities of shared blood and/or experience. As a part of Howard’s College of Arts and Sciences Freshman Seminar Program in 2015, Dr. Beatty placed Ta-Nehisi Coates’s series of essays to his son Samori (and, by extension, to an American nation consistently deaf and mute to the concerns of its African citizenry) in the context of the classical African explication of intergenerational sebayt. Coates visited Howard later that semester to discuss this now-famous set of letters/essays, Between the World and Me. His name literally means “Black Land” in Middle Egyptian. By replacing Coates’s form in the genealogy out of which, knowingly or unknowingly, it emerged, Beatty revealed and re-membered the African tradition, the world’s oldest. He noted that, as Ta Nehisi’s father, legendary Black Classic Press publisher, Baltimore Black Panther captain and Bibliophile Paul Coates did for him, Ta-Nehisi did for Samori, and African fathers and sons and mothers and daughters have done for millennia. Ellington Fuller is one among a steady and growing number of next generation Africans being introduced to their similarly-seeking agemates, the apprentices directly in front of them, and the elders who have received the speeches of those who have heard. This collective transcends time and space, drawing instruction and inspiration from Ancestors like Imhotep, Ptahhotep and Kagemni from far antiquity viewed now through disrupted, disputed but also resilient and restorative intellectual genealogies. Our work is not work undertaken a form of exclusionary, elite academic practice. Rather, we seek to restore the intergenerational dialogue, on Africa and Africans’ own terms, so that we might speak to the world from rich perspectives that, if properly understood, can contribute to human transformation.